Sweet on the nose with burnt caramel and barley sugar, followed by a filigree fruitiness of apricots and peaches. Slightly minerally with subtle smoke and a touch of peat, mixed with cold ash. Oak spice comes through along with pepper, allspice and a whiff of cloves in the back. Not the big peat punch but smooth and mature. Bold and intense on the palate. Very warming mix of cracked black pepper, cloves and oak spice, followed by a delicate sweetness of barley sugar, caramel and peaches. Then smoke arrives lingering with subtle peat and a hint of seaweed towards the finish. The finish is long, nicely warming and creamy with barley sugar and anise. Becomes drier on the tail with oak, soft peat, subtle smoke and a hint of green walnut. Dry and spicy on the nose when a few drops of water are added. There's more ash, bitumen and medicinal flavours coming through with a touch of barley sweetness in the back. Significantly mild, smooth and creamy on the palate wth only a whiff of black pepper, cold smoke and a touch of peat. A filigree barley sweetness lingers with caramel towards the finish. The finish is shorter with dry notes of oak, ash and anise in the back. A beautifully matured, expressive malt whisky from the Isle of Islay with a wonderful mix of creamy sweetness, fruity notes and fairly warming spices. 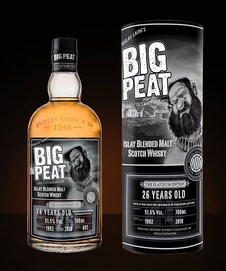 In contrast to the Big Peat standard bottling, the maturity and balance of the aromas are clearly noticeable. Those many years of ageing in oak casks have tamed the impetuous smoky and peaty notes of Big Peat and brought an elegant sweetness, fruitiness and warming spiciness perfectly to the fore. Ideal for relaxing hours in front of the fireplace. I thank Douglas Laing & Co. for the complimentary sample and the image!